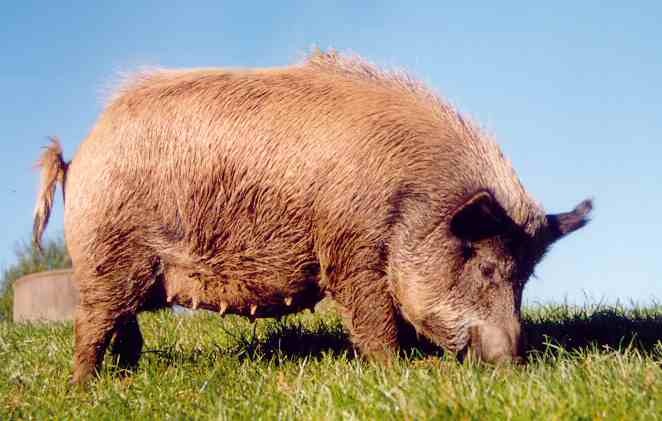 The Euro is derived from the European Wild Boar from Europe, and is regarded as one of New Zealand’s rare breeds. 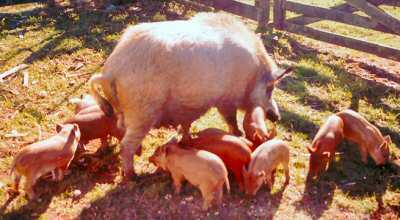 The breed was maintained by a small number of very keen breeders, and has increased in popularity due to being suitable for farm parks, as a pet pig and also for its meat. It is smaller that most breeds of pigs, and has the body conformation of a feral type. The characteristic long snout and sandy to russet colour are also strong characteristics of the breed. The breed is known for its very alert nature, hardiness, and good mothering ability. The piglets are born with juvenile striping (a colour camouflage common in feral pigs) which fades with age. The disadvantages of the breed are that they do not have the growth rate and early maturing characteristics of the commercial breeds, and while intelligent and docile can be more difficult to manage than some other breeds. They are a relatively easy-care pig, and their hardiness and docile nature make them suitable for extensive grazing blocks. Go to Euro Standard of Excellence.